Frying chicken wings then re-frying them might be the key to perfect wings. J. Kenji Lopez-Alt took chicken wings to the Serious Eats Food Lab and found that cooking them once at a lower heat, then frying them again at a higher heat produced wings that were juicy inside and crispy outside. The double-fry may produce great results on plain, raw wings, but it's likely to be a disaster if you're looking to reheat leftover wings that have been seasoned, breaded or sauced. In that case, the oven is the best way to go. Plain wings are wings with no sauce, breading or spice rubs added to them. You can re-heat plain wings by frying, but the process can be hit or miss. If you don't cook the wings at just the right temperature for just the right length of time, you'll get either greasy, soggy wings or tough, dried-out ones. For best results, submerse the wings in 350-degree Fahrenheit oil for as long as it takes them to reach 165 F inside -- about five to 10 minutes. You can cook them longer if you like crispier wings. Just be sure to check on them every two to three minutes to make sure they're not drying out. Breaded or battered wings may cook up golden and crisp on the first fry, but that's where the frying magic ends. If you decide to re-fry these types of wings, the batter will likely just mop up grease and lose flavor in the bubbling oil. You also run the risk of burning the coating before the chicken reaches a safe internal temperature of 165 F. The moisture inside the chicken can cause the batter or coating to break apart and shed as well. Reheating them in a 400 F oven is the way to go. Skip the microwave because you'll get soggy and rubbery wings. 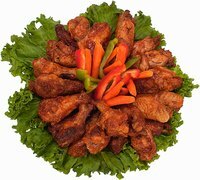 Wings that have been coated in a sauce or glaze, such as barbecue sauce or honey mustard glaze, should not be re-fried. If you chose to re-fry them, most of the sauce or glaze will come off of the chicken wings and spread out into the oil. Both the sauce in the oil and the sauce that remains on the chicken wings will likely burn before your chicken wings are heated through. If frying in a shallow pan, such as a skillet, the sauce could burn on the bottom. Even if you cook the wings until they're hot throughout, they'll have a charred or burned flavor. These wings are also best reheated in a 400 F oven until they reach an internal temperature of 165 F. Once they're heated to the proper temperature, you can remove them from the oven and add additional sauce. Use fresh sauce, not sauce than has been in contact with raw chicken. Seasoned or dry-rubbed wings are a coin toss. In some cases, the wings are so lightly seasoned that they can be re-fried just like plain wings. Heavy seasoning rubs can act like breading and either pull away from the chicken and burn or remain on the chicken and burn. You may be able to bake them in a 400 F oven until they're warmed through, then re-fry them for a brief period at 350 to 400 F to crisp them up. If you choose this option, keep a constant eye on the wings to make sure they don't burn.